Ahab is an unscrupulous leader who does anything to gain advantage, and today we watch him violate a ban on war – an action for which he will later pay with his life. In Chapter 21 is the famous story of his seizure of Naboth’s vineyard. In Chapter 22 he will die in battle. 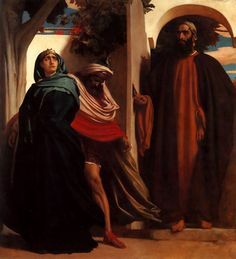 Ben-hadad, one of several men of this name in the Old Testament, attacks Samaria several times, is victorious once, but more frequently suffers defeat. Reading through the ups and downs of the fortunes of individual men, we see a picture that is much like our own lives. Things go well for a while among nations, and then they sour. Leaders agree in principle to a concept, later they back away. Promises once looked to for hopeful solutions to grave problems become lost in pride and greed. We might become caught up in the drama and tragedy of lives spent so quickly and thoughtlessly. We might become despondent when we watch good ideas wither from neglect. We might become pessimistic or even cynical when we see goodness overtaken by evil. We might become hopeless as we witness continual injustice. This will happen when we see as humans see . . . and this will not happen when we see as God sees. When we see as humans see, we take today’s story and see a series of military and political victories and losses. When we see as God sees we are cognizant of the many lives caught up in the machine of battle in which leaders engage coolly, moving war equipment and troops as if they were pieces on a chessboard. When we see as humans see, we regard each day as a series of battles to be fought and won: getting to work on time through traffic, battling with colleagues for agendas, making certain that our perspective is the one seen by friends or colleagues. When we see as God sees, we regard each day as a gift through which we experience many interchanges with family, friends, colleagues, and even strangers. We see the wisdom in coming to consensus, of standing in solidarity, of witnessing to injustice and of handing over our problems to God. These are the victories that nourish. These are the victories that give life. When we see as humans see, time and location are often stumbling blocks. When we see as God sees, they are gifts to be received, shared and returned in gratitude to the one who gives us life. These are the many small victories that build up as our treasure. These are the victories that cannot be taken away, that cannot be reversed. These are the victories that will last an eternity. A Favorite from December 20, 2009.